If possible, get a screen recording of the demo of any existing product. Commission a designer to work with the client to create an agreed design. 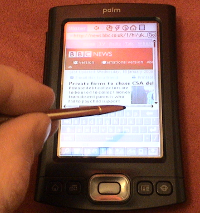 A designer will build mock-ups and wireframes and put together a responsive page layout suitable for mobile, tablets and desktop computers. The client will sign-off these designs and then we can build the site. Build the site with the client using an iterative process. For this to work, the client will need to be available to quickly answer questions and give feedback. For an iterative process to be successful, we need to keep screenshots of the design on target devices as we build it. This will allow us to compare versions and quickly see where the design has changed. Agree an hourly rate for this process.